Ben is the founder of PorKman's Table. While not a traditionally trained Chef, Ben began cooking as soon as he could reach the stove cooking breakfast for his parents every weekend by the time he was 4 years old. His love of food has only grown and has experience cooking in many restaurants in his native Pennsylvania. After graduating from Bucknell University, he moved to Phoenix Arizona to be a Teach for America corps. member. While in Phoenix he learned all that he could about Mexican cuisine and South American flavors. After two years in Phoenix, Ben moved to Atlanta to pursue a job as a Financial Advisor, and his love for food only grew as he explored the southern food scene. He is a student of food and cooking and is always looking for inventive combinations. Jason is the Chef de Partie at Porkman's Table. Born in Michigan and raised in Atlanta, Jason graduated from The Culinary Institute of America. Jason has cooked at various restaurants, and currently works as a private chef. Besides being the eye candy in the kitchen, Jason is our workhorse running the kitchen during service. Jason has lots of experience cooking many types of cuisine, and his wide array of techniques lends itself to the unusual mash-up of cuisines served at Porkman's Table. Whitney is head of the Porkman's Table Beverage program and team photographer. Whitney graduated from Bucknell University with a business degree and currently works in marketing. You can see our resident mixologist at dinners crafting cocktails, helping keep your glasses full and spirits high, and of course snapping some pictures along the way! Emily is a born-again food lover who relishes any opportunity to try the new, unusual, and exotic. She graduated from Vanderbilt University and took a job in Atlanta as a Project Manager. At Porkman's, Emily keeps your glasses and bellies full while coordinating the front of the house and business manager. Payne, the co-founder of Porkman's, is an amateur chef who has poured himself into the culinary world. After graduating from Vanderbilt, Payne moved back to his native Atlanta. He currently works as a consultant during the day, but focuses on fitness and food at night. Due to his patience and attention to detail, Payne's is our molecular gastronomy guru. Jonathan is the Porkman's Table designer and builder. His creativity can be seen as he continues to improve the kitchen, dining room, and even prepare our backyard for outside dining. 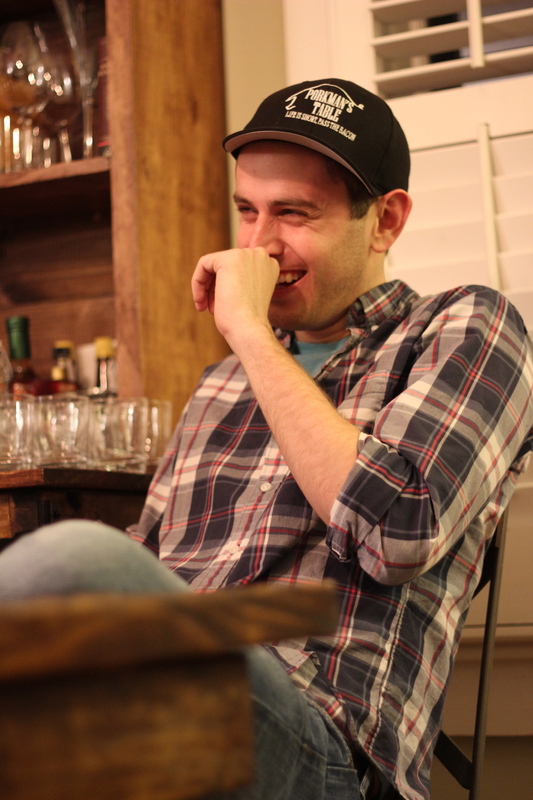 Jonathan is currently a designer at Jamestown and previously graduated from Vanderbilt with an engineering degree and Georgia Tech with a masters in architecture. Vida is the Porkman's Table welcoming comittee, food quality manager, and cuddle bug. Nuf said.